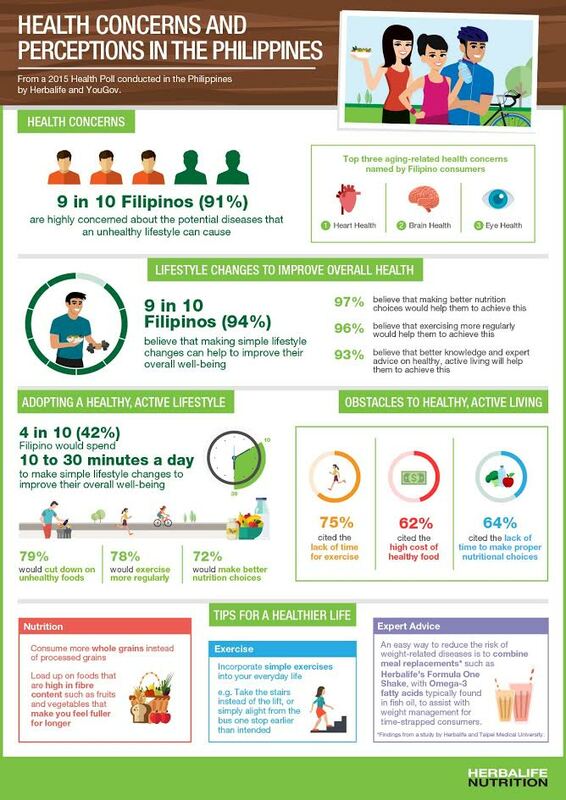 Herbalife Health Poll: 9 in 10 Filipinos ”highly concerned” about the potential diseases that an unhealthy lifestyle can cause - Hits and Mrs.
A good number of the respondents expressed willingness to adopt a healthy lifestyle; 79% said that they would cut down on unhealthy foods, 78% expressed their willingness to exercise more regularly, and 72% said they would make better nutrition choices. “We welcome the results of the survey. It gives an understanding of Filipinos becoming even more health concious and self-aware that they need to make some lifestyle changes to improve their overall well-being. It also gives Herbalife an idea where we are needed, because as the survey revealed only four out of 10 would spend 10 to 30 minutes a day to make simple lifestyle changes,” said Rosalio Valenzuela, Herbalife Philippines General Manager. The respondents, however, cited the following as the top obstacles to achieving a healthy lifestyle: lack of time for exercise (75%), lack of time to make proper nutrition choices (64%), and high cost of healthy food (62%). Dr. Heber, who is the founding Director of the UCLA Center for Human Nutrition at the University of California, Los Angeles, will be conducting a symposium for free to Filipino medical practitioners on October 23, 9 AM, at the Manila Hotel. The symposium will gather a group of 100 doctors, nurses, physical therapists and medical practitioners. The title of the symposium is “Obesity: More Than Just Being Overweight and Nutrition Forecast for 2020.” Seminars of Dr. Heber are recognized by US hospitals as part of Continuing Education Studies, which are often required of applicants. The following day, Oct. 24, Dr. Heber will be holding seminars for thousands of Herbalife Independent Members in the same hotel.